legendary chef and restauranteur, Charlie Trotter. 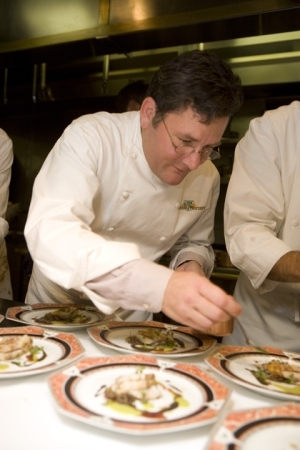 orld-renowned chef, famed restauranteur, and selfless philanthropist, Charlie Trotter gives Food and Beverage Today a candid snapshot into the life of a culinary demigod. The dishes on the day's menu: his personal baptism-by-fire culinary education, the benefits of a "living tasting menu" and why perhaps his job should be "illegal." You feel it from the first glance you get of the place. Walking up the circular drive to the front entrance of The Sanctuary, you feel the enormity of Kiawah Islands resort-within-a-resort  both in scale and design. The staffers warm greetings and the opulence of the lobby only reinforce the air that you are in this place for something way beyond ordinary. Today, that extraordinary happens to be one of the worlds best chefs and a national culinary icon. "I was voted the second meanest person in Chicago," said Trotter, holding court in a posh lobby drawing room. "Michael Jordan was first and Mayor Daly was third. I figure that puts me in pretty good company." While Chef Trotter’s kitchen demeanor has been said to be "intense," I am chalking that up to the stuff of culinary lore. In casual conversation however, he is forthcoming, contemplative and demure. Before our sit-down the chef leans over a stack of cookbooks awaiting his signature. Prior to the pen touching the page of each book, he pauses and looks upward, squinting a bit behind his small glasses, as if divining for inspiration. What’s important to realize about Chef Trotter is that he is not your standard chef. He didn’t come from a family with a large emphasis on food and cooking. He will tell you that his mother “had a repertoire of about six or seven dishes and you would get those in a standard rotation.” He didn’t graduate from an esteemed culinary institute. In fact, he never attended culinary school at all; instead his culinary prowess comes from the rigorous and ridiculous amounts of hours spent in the kitchen. Now, before you chalk this up to narcissism run amok, you also have to realize that his work ethic isn’t standard either. Meet culinary legend Charlie Trotter, visit with the masterminds behind Sweet Tea Vodka, explore Charleston's vibrant restaurant scene and stay up to date on all your industry news in Food & Beverage Today. Meet Master Chef Charlie Trotter and take notes as he shares his love of the craft, well-earned reputation for being mean and his smart philosophy on food, wine and life. Get to know master vintner Dan Duckhorn and his Duckhorn Wine Company. Learn how Firefly Vodka carved a niche in this competitive market with their Sweet Tea Vodka. Visit the ten best Charleston restaurants not to miss in 2009. Soba noodles have moved into the mainstream, but where did they come from? Locally grown products are changing the face of food and beverage as more people are living la vida local. San Miguel restaurants are not just a Mexican marvel. Whatever your taste or budget, this expat town caters to it all.